I literally can't even look at this picture. There have been too many strawberries in my life lately. When I look back on the last few days all I see is a whirlwind of jam, mountains of shortcake, buckets of berries looming on all sides, and millions of pies raining slowly down from the heavens. There's our strawberry patch. Loverly. So let's talk about this tart. 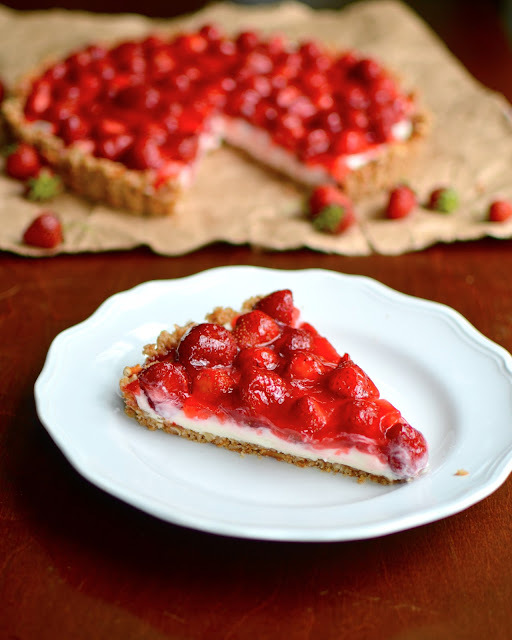 It might look vaguely familiar to your ravenous eyes, but perhaps the words "strawberry pretzel salad" or simply "strawberry dessert" or maybe "that awesome strawberry thing that that one person always brings to all the potlucks" will stir your memory. Yes, this is that dessert. I just made it in a tart pan to make it seem a little more fancy or something. Also I made the Jello part less Jello-y by using the recipe for this Jello pie. That's my Grandma's little trick. So when I was uploading the photos for this post my brother came up and said, "What is this? One of those things where you have to find what's different in all the pictures?" "Um... Hello. They're all totally 100% different. See, the first one is more from the front and this one here more from the side, and then this next one is... well it's from a totally different angle and then this one... Ugh. Just go away." Then Dad comes up and sees me gaping stupidly at the picture of the flying strawberries, trying to decide what order to put the photos in. "Hey, that's pretty cool" he says. Then he reaches over and scrolls down through them all and says, "Are you still deciding which pictures you want to keep on here or what?" "No. I'm posting ALL of them." And so I am. Long story short: I apologize for any redundancy you may have experienced in my photos today. Preheat oven to 350ºF. Combine and press firmly into a 10 inch tart pan (I use a heavy glass with a flat bottom to press it down well). Bake for 10 minutes and allow to cool completely. Beat the cream cheese and sugar until smooth. Add vanilla. 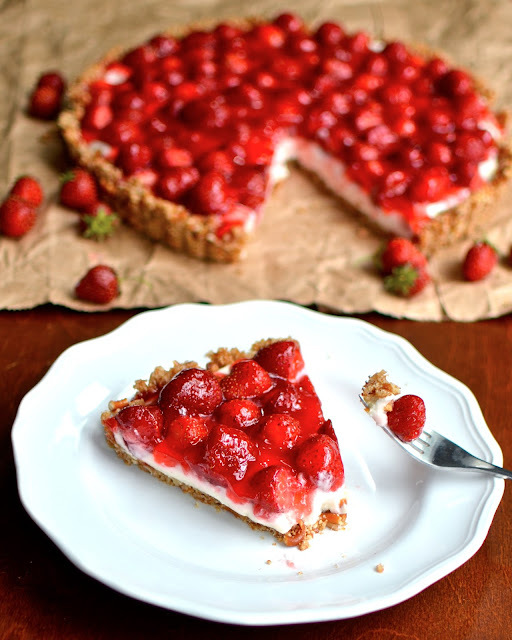 Fold in the whipped cream or Cool Whip and spread into completely cooled crust. Combine the sugar, water, and corn starch and bring to a full, rolling boil on the stove. Boil for two minutes, whisking constantly. Remove from heat. Add the Jello and whisk until combined. Allow to cool slightly. Arrange the berries on top of the cream cheese layer and then drizzle the Jello mixture over the berries, trying to cover each berry. Refrigerate at least a few hours or until the Jello layer is firm. NOTE: to make this as a regular pie, you can probably just use this same recipe and all the layers will just be thicker.